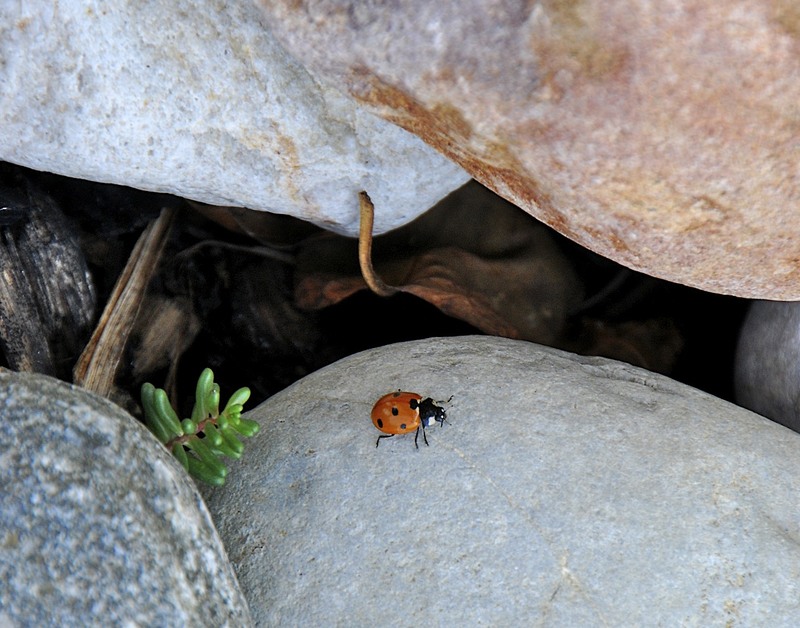 A while ago, I saw this ladybug walking around the rock garden while trimming some shrubs near our mailbox. Usually found on leaves and plants, this one was happily wandering the goose egg river stones, seemingly enjoying the weather, glancing at the nearby “tree,” and peeking deep into the caverns, from which the stem of a dead leaf protruded. I like lady bugs, or Coccinellidae, as they are known to scientist who like to spell things funny. Not only are they amongst the cutest insects (they technically are not “bugs,”) but also feed on Aphids, which are not so cute, and in turn feed on my flowering plants! But looking closer while processing this image, I wondered what it would be like to be there, inside, amongst the BIG Boulders, underneath that leaf. Then I thought….I’ve been there! 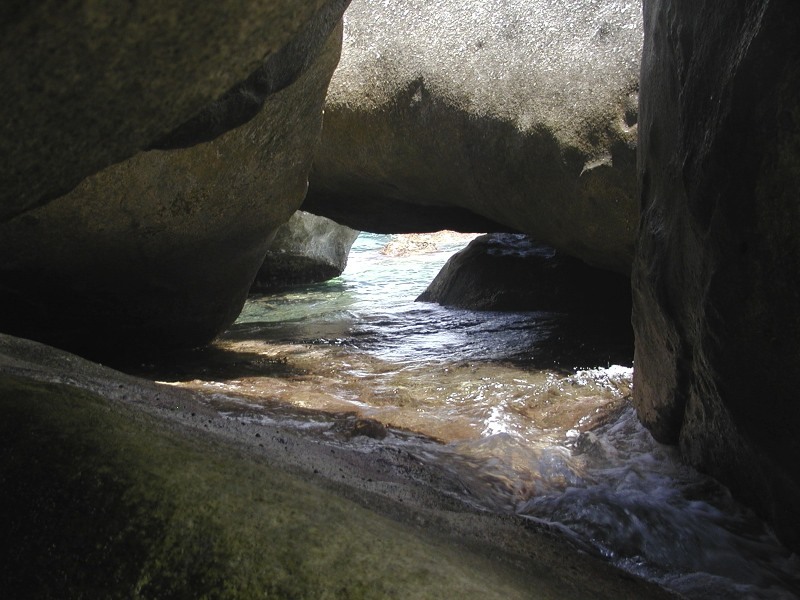 I’ve explored, and climbed on the eroded granite surface of these very rocks, and crouched underneath and around, and even sloshed in pristine water of it’s grottos and pools. 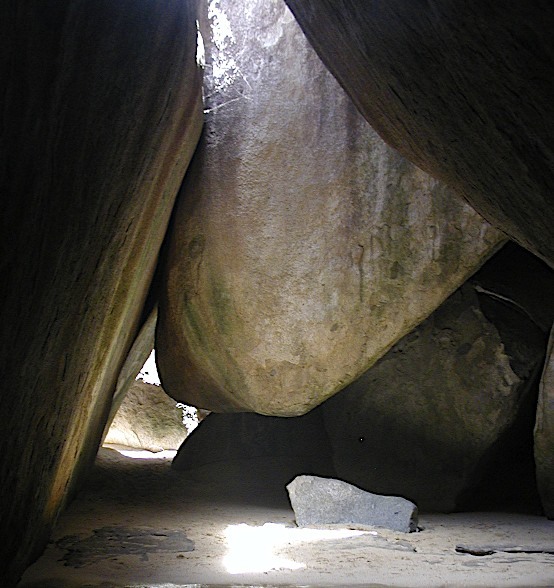 Yes, a magical place called The Baths, on Virgin Gorda, in the British Virgin Islands, where ancient volcanic eruptions spewed enormous granite blocks into the air to fall in piles on the beach, eventually eroding into an explorers treasure. Maybe if I waited long enough, I could have seen the presence of a gigantic camera lens curiously peering down from above. Fantastic photos and a great observation! Thanks, and thanks for following. I agree ! Great shots and great point of view/perspective ! Thanks for the reply, and for following.